A few months ago I made jerk turkey tenderloins and served them alongside a delicious kale concoction that was braised in coconut milk and some onions & peppers from the roasted turkey. 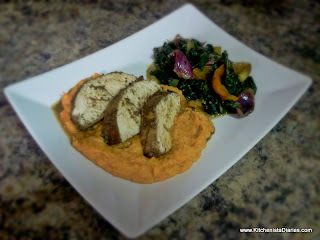 I knew I would have to return back to recreate that as a side dish recipe for The Kitchenista Diaries! 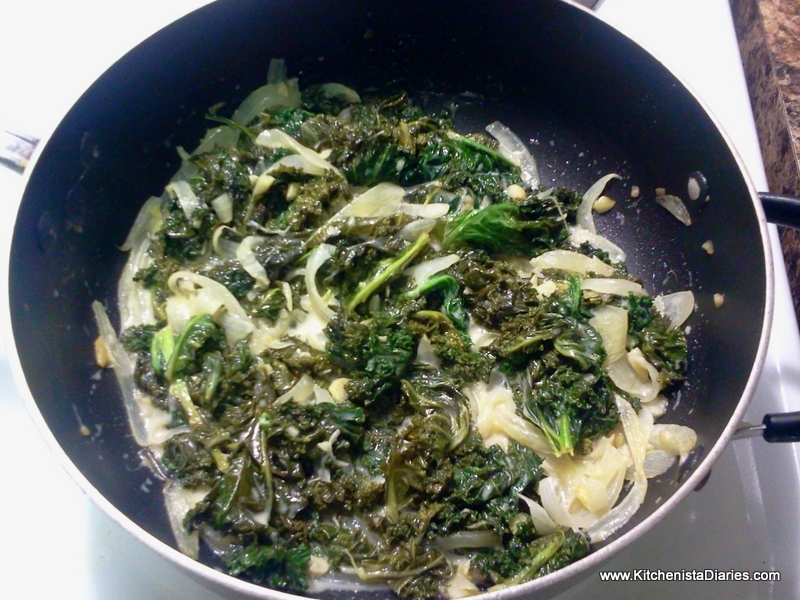 Coconut Kale reminds me a lot of creamed spinach, but heartier and sweeter. It's also vegan! You can use any kind of kale with this because the coconut milk cuts into the bitterness of the kale leaf. Sweet onions, ginger, garlic and a hint of lime help to round out the flavors here and make this a perfect complimentary dish to Caribbean meals. 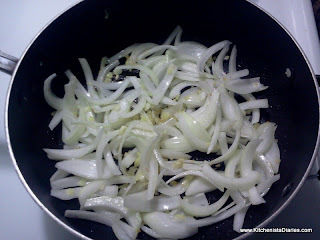 Slice the onion, and mince the garlic and ginger. 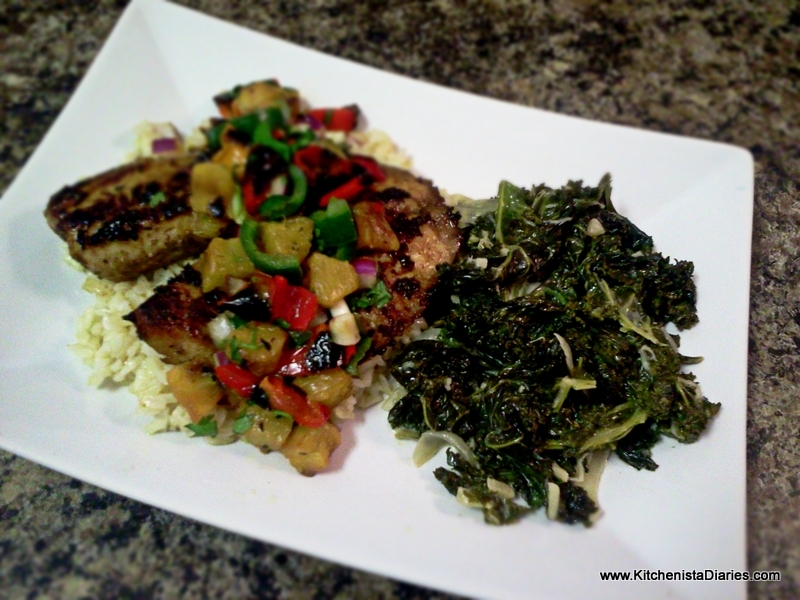 Remove the stems from the kale. I do this by chopping off the thicker stem ends then gently tearing the leaves away from the upper stems. 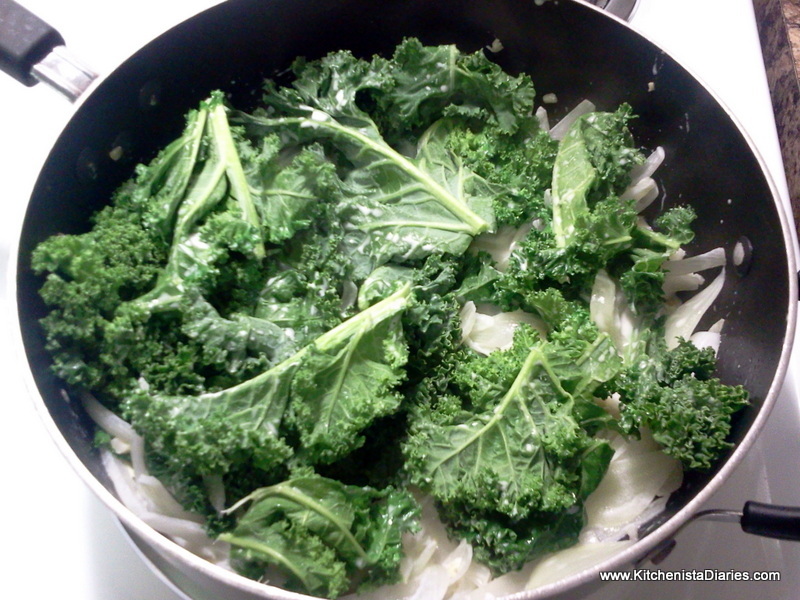 Rinse the kale in cool water, making sure to remove any grit. I recommend using a salad spinner to drain excess water from the kale leaves. Heat your pot or saucepan to medium, add coconut oil. 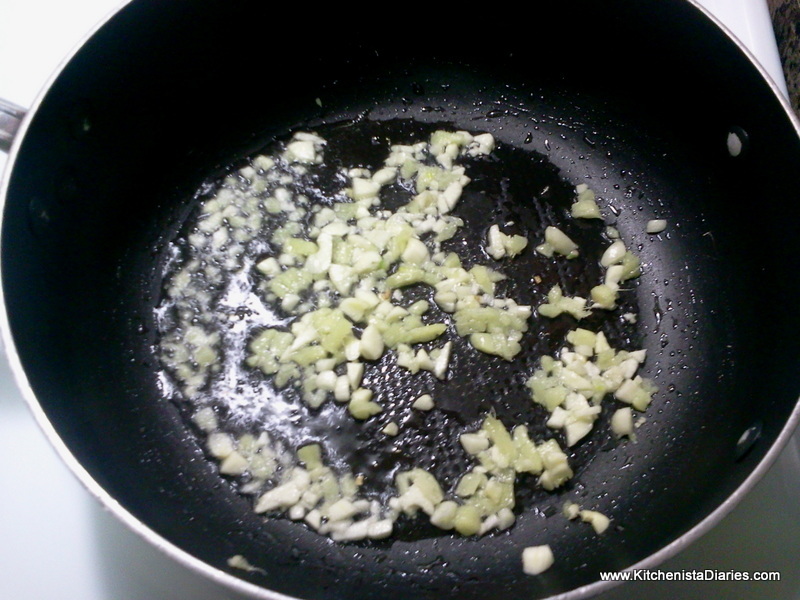 When the oil is hot cook the minced garlic and ginger until fragrant, 1 - 2 minutes. 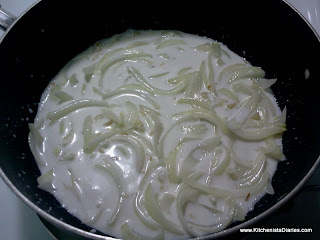 Add the sliced onions and cook until onions soften, another 2 - 3 minutes. Add about 1/2 cup or so of coconut milk. Cook just long enough to warm it through, does not need to boil. Start adding the kale. Most likely you'll need to add in batches, allowing what's in the pan to wilt a little bit before there is room to add more. 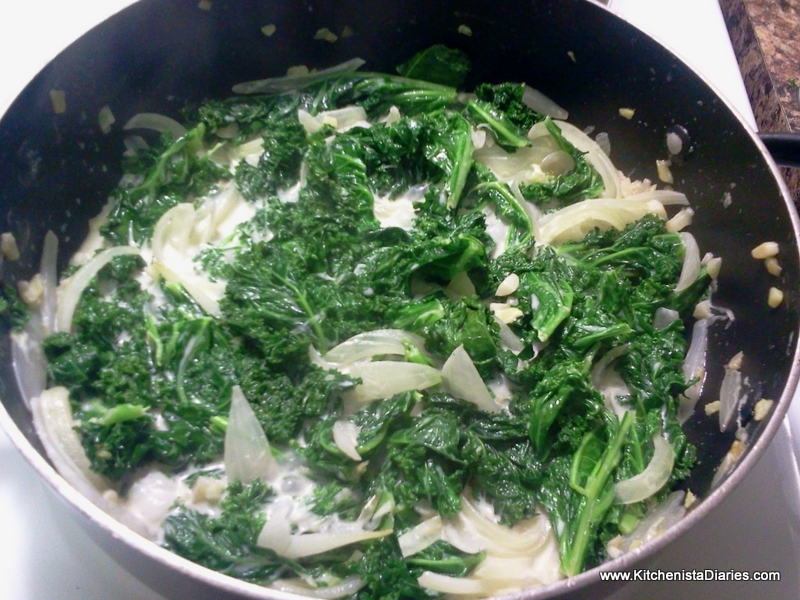 Once all the kale is added, make sure there's enough liquid in the pot to braise the kale. I added a little bit more coconut milk. 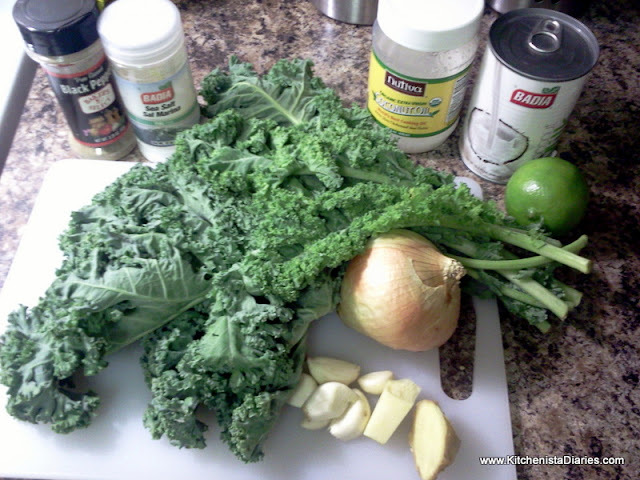 Season kale with a pinch of salt and pepper; squeeze the lime juice. Reduce heat to low and allow the kale to simmer for 20 minutes or until tender. Check on the kale every 5 minutes or so; if all the liquid has been absorbed add a splash of coconut milk. 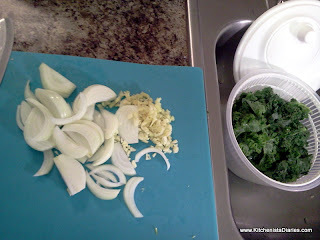 I ended up using just 1/2 can total, but I had a fairly small bunch of kale. Serve warm! Easy variations to this could be adding sliced red or yellow bell peppers, or replacing half of the coconut milk with chicken broth. Below are the two dishes I made this for, the first was the Jerk Turkey Tenderloins and the second was this week's Sunday Dinner, Jerk Tilapia. Check out my next post for that tilapia recipe!